A scorching summer of oil spilling into the Gulf of Mexico in 2010 reminds me a lot of another scorcher summer of oil spilling into the Gulf in 1979. That’s the last time a huge flood of crude blemished the Gulf of Mexico. The Itox Gulf oil rig explosion sent a gusher frothing oil over the surface from the continental shelf a few miles off the Yucatan Coast of Mexico. Except for the depth differences, the BP Deepwater gusher boiling up off the coast of Louisiana from a 5,000-foot depth, rather than 160 feet, these two spills share a lot in common. Both have taken many months to cap: Itox in ten months, Deepwater looks like it will take four. The former clogged the southern Gulf of Mexico with 3.5 million barrels of oil making it the third worst accidental oil spill in history; the latter so far has dumped 5 million barrels into the northern Gulf of Mexico and now stands as the worst accidental oil spill in history. Though Deepwater’s oily sheen stretched for a time across an area the size of Pennsylvania from late April to early July, now in early August NOAA (National Oceanic and Atmosphere Administration) declares 75 percent of the goo is gone. “Absorbed” to be exact. The corporate media eats up this report like anaerobic ocean bacteria tucks in tar for tucker with little to no skeptical inquiry. Also the FDA (Food and Drug Administration) chases NOAA’s happy spill of spin with their own, that all the vertebrate fish and invertebrate shell fish swimming in that dispersant rich toxic mix of “absorbed” oil still raining down on oyster beds, crab and shrimp make these “safe” to eat. Big business must go on, it seems. Get those Gulf fisheries back on net line harvesting the ocean’s oily gilled and bivalved bounty. Get those people back to work before region-wide gulf state unemployment influences their votes for the mid-term elections. Thank you dispersant toxins for sweeping the slick under the watery rug of the Gulf ocean surface. I wonder if short term profit and political gain might postpone a serious appraisal about just what impact on human health eating hydro-carbonated marine animals will have in the coming decade. Heck, American’ts postpone tackling the oncoming Debt Bomb, why not delay a serious investigation into the effects of the dispersants in what will be a crude dispersant pestilence upon human consumers? We have a habit of not facing our toxic problems (social, economic and ecological). It reminds me of a consequential prophetic outcome written in Century 5 Quatrain 63 of Nostradamus’ history of the future, when he augured the following: “There will be several plagues upon mankind.” Many of these pestilences implied to be man-made. This brings me back to another similarity between the oil spill summers of 1979 and 2010. Itox in 1979 and Deepwater in 2010 share summers remembered for their record-breaking and extended heat waves across the Gulf and Mississippi River states. Did both spills somehow have a toxic influence on water evaporation in the Gulf of Mexico that lead to very hot summers across the eastern two thirds of the North American continent? The historic hot summer of 2010 spikes much higher than the record swelter of 1979. The temperature rises in intensity parallel the increased size of the third and first worst accidental oil spills in history in a body of water from where much of the subtropical heat cast over North America comes. Climate made famished for water evaporation by hydrocarbon steroids? There has never been recorded such a wide-ranging and lingering triple-digit heat wave across the states of the American South and Mississippi Valley. NOAA predicted a hurricane season to rival the storms crowding 2005 when Hurricane Katrina devastated the Mississippi coast and broke the decrepit levies around New Orleans. The first week of August 2010 is nearly over with nary but one minor Hurricane Alex on the books. What has dried out the Caribbean and Gulf areas like 1979? Is it coincidence. Is it a fortunate spate of off shore wind sheer cutting down the strength of the “canes” before they are “able” to murder the Gulf with winds, storm surges and rains? Is it the Gulf waters, and a lot more? The 1979 season, like the first two months of the current Hurricane Season of 2010 had only seen one weak hurricane (Bob for 1979; Alex for 2010) briefly visit the Gulf. Both in mid-July. Unlike July 2010, the Gulf in late July 1979 did experience a gully washer torrent of rain across the Texas coastline from tropical storm Claudette making it one of the most damaging tropical storms on record never to reach hurricane force; however, no other hurricane entered the Gulf until Hurricane Henry around 17 September 1979. Henry went down on the record books as was a rare example of a storm entering the Gulf of Mexico and dissipating without making landfall. Was an oily film from the Itox spill blocking the full evaporation feast of moisture it needed? Is it a coincidence that the last time the Gulf had suffered a scab of an oily sheen in 1979 the weather patterns drew dry and record-breaking hot. Moreover, summer 2010 like 1979, is also a year enduring a strong though currently diminishing El Nino climate altering heat-up of the Eastern Pacific equatorial waters. Nevertheless, perhaps the collapsing El Nino in 2010 has enough strength left to quiet down the Atlantic Hurricane Season like 1979 and oil slicks have nothing to do with it. A far larger oil slick in 2010, coincides with an equally and far wider ranging, triple-digit heat wave across the Mississippi Valley states all the way north to Minnesota. These and even the Atlantic seaboard states sweltered with mid-summer temperatures in the spring months of late April and May. Is it bad luck only that the Deepwater disaster started on 20 April? Does water evaporate properly when under the skim of hydrocarbons? Can a large portion of the northern Gulf laced with particulated hydrocarbons dispersed from the surface to ocean floor depths in vast oil cloud plumes not have some impact on the watery engine of atmospheric evaporation pumping subtropical moisture far into the temperate zone? The fossil carbon farts of oil and coal make a Greenhouse Effect trapping the sun’s heat in the atmosphere reflecting the heat back to earth. Move from air to water, from heat trapped to heat reflected. Could carbon slurry in its pre-exhaust form in the ocean inhibit enough natural water evaporation under an viscous greenhouse rainbow sheen to render a subtle altering of weather patterns to a hotter degree? My rhetorical questions are not science. My intuition might be imaginary. Then again, perhaps the future climatologists will find some correlation. What I’m pondering is not scientifically proven. Not yet. I wonder though how much mucking with the oceans can tip a slight degree of evaporation across a large enough water surface to slightly alter the rpm of the climate temperature engine running the motor slightly too hot. Bearn, Bigorre par feu ciel en destresse. At the end of Cancer (22 July) so great (is the) drought. (Southwest France) in distress from fire in the sky. Nostradamus warns us against creating a future drought of biblical proportions that will burn a swath across latitude 48 in the Northern Hemisphere. Drawing a line across that latitude on a map, we touch on nearly all the world’s chief grain belts. Today’s amber oceans of wheat stretching across North America and the Soviet Ukraine revert to prairies and inhospitable steppes in the next century. [Note the] quatrain Indexing Date: “Q98” = 1998? In my last Nostradamus book [Nostradamus: the New Revelations, 1994] I correctly interpreted the increase in global warming after the mid-1990s when the dust from the eruption of Mt. Pinatubo  that slightly cooled the world had cleared the skies. With this interpretation in mind, we can expect a wave of global droughts and heat waves by July 1998. From that time onward global warming steadily kicks in, disrupting weather patterns and the climate conditions needed to grow grain, start to shift hundreds of miles north of where they are now. 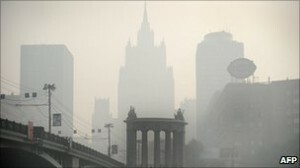 The Moscow skyline choked with smog from forests surrounding the city set ablaze (above, left). Source: AFP. 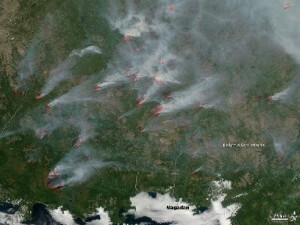 The Russian fires seen from space (NASA). The year 2010 visits upon Russia the worst drought, brush and forest fires in 130 years of recorded weather history. The Indian heat wave before the Monsoon came in June killed hundreds if not thousands across South Asia. The US had endured sustained and historic bouts of triple-digit heat waves east of the Rockies starting since mid-spring. Yesterday, the Russian Federation announced that all exports of grain will cease due to the crop damage caused by 2010’s sustained spring and summer droughts. Flames devour Forest and brush fires have become Russian wheat field fires. Prime Minister Vladimir Putin banned all grain exports for the next 4.5 months so his country can at least feed itself. Russia is the third largest exporter of grain on this hungry and overpopulated planet. Russian fields of desiccating grain lie mostly along Latitude 48. The quatrain’s indexing “98” bears a second look. In 2001, a United Nations commission on climate changes declared that the 1990s were the hottest years on record in the last millennium. Climate science reports the tropics are expanding nearly 600 miles into once temperate zones demarcated by the tropics of Cancer in the north and Capricorn in the southern hemisphere. The Science Times reported that temperatures in 1998 shattered global temperature records. Since the spike of heat in 1998, every year since then records a hotter mean temperature than all the years before 1998 and the year 2010 is poised to shatter heat records of the hottest year of them all — 1998! 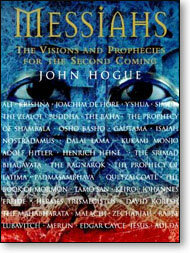 Messiahs: The Visions and Prophecies for the Second Coming. Available at HogueProphecyStore (click on the cover and read more). The next blog will be part three in my series on The Path of Trust. There are treasures in it. Antidotes in anecdotes for the behavior that compels the Earth and its climate go to war with humanity. I’m not talking about wonder green alternative fuels here. One must take a step backwards, deep-wards. One must experience and awaken the “inventor” before there is a conscious, balanced and loving use of human invention. The Path of Trust series, taken from my book Messiahs, explains how one can come to the root of Earth’s solutions by coming to the root of one’s existence through a meditative awareness. This entry was posted in Global Warming and tagged 1979, 1998, 5 Q98, 8/06/10, American’t, Cancer, Capricorn, Deepwater Horizon, El Nino, FDA, Greenhouse Effect, Gulf of Mexico, Gulf oil spill, heave wave, Hurrican Alex, Hurricane Henry, Hurricane Katrina, Iraq, Itox, John Hogue, latitude 48, Louisiana, Mabus, Messiah, Mississippi Valley, Monsoon, NOAA, Nostradamus, path of trust, Pemex, Persian Gulf oil spill, predictions, Putin, Republican Guards, Russian fires, Russian heatwave, Saddam Hussein, Science News, triple digit, triple-digit heatwave, Tropical Storm Claudette. Bookmark the permalink. Post a comment or leave a trackback: Trackback URL.